Bucaramanga is the capital city of the department of Santander, Colombia. Bucaramanga has the fifth largest economy by GDP in Colombia, has the lowest unemployment rate and has the ninth largest population in the country, with 521,857 people. Bucaramanga has over 160 parks scattered throughout the city and has been given the nickname "La Ciudad de Los Parques" ("The City of Parks") and "La Ciudad Bonita de Colombia" ("Colombia's Beautiful City"). Bucaramanga has grown rapidly since the 1960s, mostly into neighboring locations within the metropolitan area. Floridablanca, Girón and Piedecuesta are inextricably linked geographically and commercially with Bucaramanga, and now all form together the Bucaramanga Metropolitan Area in Colombia with 1,141,671 inhabitants. The city is the base of the Colombian Petroleum Institute (ICP), the research branch of the state oil company Ecopetrol. Girón was the first and most significant town founded by Spanish colonizers in the region, and Bucaramanga (founded on December 22, 1622) did not overtake Girón in population or economic significance until the early 19th century. In the 1860s and 1870s the city attracted a core of German merchants and adventurers (the most famous of whom was Geo von Lengerke) and tensions between the newcomers and local merchants flared in 1879 when the event named "La Culebra Pico de Oro" (The snake of gold beak) occurred. With the political reorganization of 1886 Bucaramanga replaced Socorro as departmental capital. The region (although not the city itself) was devastated by the civil war of 1899-1902 - commonly known as the Thousand Days War causing Bucaramanga to grow modestly in the first half of the 20th century. Bucaramanga is located on a plateau in the Cordillera Oriental of the Colombian Andes, and many residents occupy unstable lands descending steeply from the meseta. Westbound of it, the Rio de Oro Canyon is located at an altitude of 600 meters (2,000 ft) AMSL. Eastbound, the Andean Range rises up in high peaks, reaching almost 3,700m AMSL in the place locally known as "Paramo de Berlin" The city is located at 7°08′N 73°08′W. The official metropolitan area includes the municipalities of: Girón, Piedecuesta and Floridablanca, but Lebrija is home to Bucaramanga's airport and is commonly considered part of greater Bucaramanga. All four neighboring municipalities contain extensive rural areas despite recent urbanization. Under the Köppen climate classification, Bucaramanga features a tropical monsoon climate, though it’s a noticeably cooler version of the climate. The city falls just short of a tropical rainforest climate as its driest month, January, averages just under 60 mm (2 in) of rainfall. 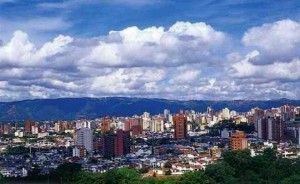 Although its altitude is not considered very high, Bucaramanga's climate is not hot nor cold with 22 degrees Celsius being the average temperature. 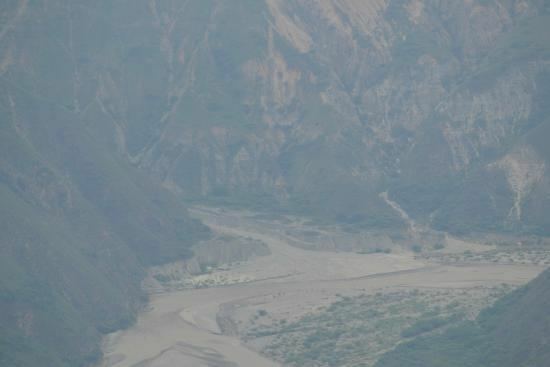 Compared to cities at the same average altitude (such as Cali), Bucaramanga has much cooler daytime temperatures due to the cold wind coming down the Eastern peaks; its night temperatures are not cold due to the warm air coming from the Canyon. This fact makes the daily thermal oscillation to be narrower than other Colombian cities. The municipal flag of Bucaramanga was designed by the historian Gustavo Gomez Mejia. Made of two green stripes with a yellow one in the middle. In the center there's a blue disk, surrounded with a red circle. In the middle of the blue disk there's a white star. In the red circle the following legend: "Below the azure of its sky and defended by the generous blood of its sons, Bucaramanga is opened to the four horizons of the motherland" is written. The words "Montani Semper Liberi" are Latin for "Mountaineers are Always Free". According to the data obtained from the 2005 census and information provided by the Metropolitan Area of Bucaramanga, the city has an estimated population of 524,112 inhabitants. Of the total population, 46.8% are men and 53.2% women. The average number of occupants per household is 3.6 people. 16.6% of people of the population are aged 10 years and over. Of all cohabiting couples in the city, 46.3% were single, 26.7% were married, 5.8% were separated and 4.6% were widowed. 9.2% of the population over age 4 who currently resides are from another municipality and 0.3% from another country. In the city, 52.4% of people live in houses, while 40.4% live in apartments and 7.2% in a leased room or other. An industrial activity developed in Bucaramanga that has gained national recognition is the footwear industry. For this reason, the Footwear Manufacturers' Association, Asoinducals, is located in the city. The footwear sector has a major market nationally and internationally in countries such as Argentina, Brazil, Canada, Ecuador, Italy, some Caribbean islands, United States, Peru, Venezuela and Mexico. There is also a big clothing industry. There are a growing number of technological research centers in various topics such as energy, gas, oil, corrosion, asphalt, leather and agro-industrial development tools, among others. The city has the Chimitá Industrial Zone located in the western area of the plateau near the town of Giron, many companies from different specialties like Terpel have production plants there. Also in the city, there's one of the main production plants of Bavaria Brewery. The city is planning to build the Zona Franca de Santander, a customs-free zone located within the metropolitan area of Bucaramanga. The 2005 census conducted by the DANE presents the following figures, 16.5% of establishments are engaged in industrial activities, 52.1% are engaged in trade activities, 29.8% are engaged in the services sector and 1.6% are engaged in other activities. 3.7% of Bucaramanga's households develop an economic activity in their homes. Establishments which have between 0 and 10 employees are the most common in the trade sector account for 54.4% of it. and business which have between 10 and 50 employees account for 41.7% of the services sector. As for the rural sector of the city, DANE figures showed that 75.9% of rural homes are occupied by farmers. Of these homes, 70.1% is devoted to agriculture, 94.1% to raise livestock, and 5.6 to fish farming. 5.6% work. These data concludes that most houses simultaneously develop 2 or 3 of these activities. Thanks to the commercial and business development that has been taking over the city, Bucaramanga has positioned itself as a city of congresses and events, having infrastructure like Fair and Exhibition Centre - CENFER, many fairs and exhibitions in all branches of the national economic sectors are performed there annually . The City also has a polyfunctional center for events and shows, which gives a space for performing great shows, puzzle games, sports and business. A number of meeting rooms and conferences allow Bucaramanga to hold conventions for entrepreneurs around the country. The trade fairs as well as direct benefits to the respective sector, have benefits in other areas of the economy such as transport, hotels, restaurants, shops and various services activities such as advertising, design and decoration, modeling, etc. The International Exhibition of Children's Fashion (EIMI) takes place in Bucaramanga. It is the only exhibition specialized in children's clothing in Latin America. The event is organized in the CENFER complex and 40% of the sales generated come from exported products. In the recent years, several major shopping centers and commercial buildings have been built in Bucaramanga. Such is the case of the shopping center La Florida, a six storey mall with two pedestrian bridges and one vehicular bridge. A newer shopping center, Megamall, was built in 2007, where the first store of the French multinational retailer Carrefour opened in the city. In the following years, three more shopping centers were built in other areas of the city: Cacique, Parque Caracolí and De la Cuesta. Another shopping district known as "Cabecera del Llano" includes five major shopping centers: Cabecera Etapa I, Etapa II and Etapa III as well as the more recognized Cabecera Etapa IV and the shopping center "La Quinta" or V Etapa. The Acropolis Shopping Center is located in an area known as Ciudadela Real de Minas, while the San Andresito commercial center and the traditional and renovated (2005) Cañaveral shopping center are located in the southern sector of the city along with the El Cacique shopping center, opened in November 2012 and considered one of the largest in Latin America. In these shopping centers, there are several movie theaters of major companies such as Cine Colombia, Cine Royal and Cinemark, clothing stores like Adidas, Levi's, and national brands such as Arturo Calle, restaurants and cafes as Presto, El Corral, McDonald's, Crêpes & Waffles, Juan Valdez. One of the largest hypermarket chains in Colombia, Exito, has five stores throughout the city and a distribution center for eastern Colombia. Carrefour opened in 2007 the first store at Megamall, merging later with a local supermarket named Mercadefam. The chain now has seven stores in the city. Along with this, there are local small chain stores in Bucaramanga such as Mercomfenalco, Cootracolta, Cajasan and others. 'Metrolínea' is the Integrated Mass Transit System of Bucaramanga. Its construction began in 2006 during the administration of Mayor Honorio Galvis; its operation is currently in its first phase. Its first phase was inaugurated in December 22, 2009; in this phase, the first 6 lines inaugurated are: Avenida del Libertador (Diagonal 15), autocentral, Prospero Finch Avenue (27th Avenue), La Cumbre, Highway Floridablanca Villabel Bucarica and which have 91 stopways. The administration is currently in the process of coupling the second phase, which will cover the areas of Piedecuesta, Ciudadela Real de Minas, the Avenue of the Americas (Race 33) and will have trunks at Autosur, Real de Minas and the Americas. 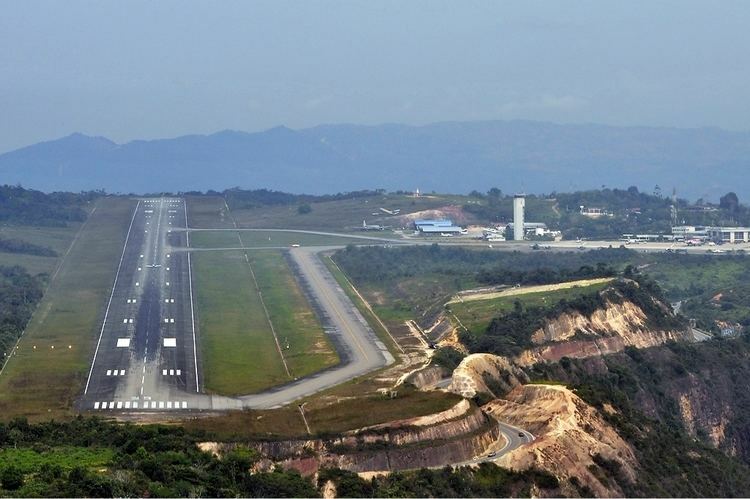 The international and domestic airport serving Bucaramanga is the Palonegro International Airport, located on the hill of Palonegro, west of the metropolitan area and close to the town of Lebrija. The airport opened in 1974, replacing the old airport Gómez Niño located in the Ciudadela Real de Minas. The airport currently operates under the administration of the Palonegro consortium Colombo-Korean SAS East Airports Group. There are daily flights from most major cities in Colombia, as well as international flights from the city of Panama. The Universidad Industrial de Santander is an official institution which offers 95 degrees and a wide range of undergraduate and graduate courses within the health sciences, humanities, sciences and engineering colleges. Also it offers seven technological programs in different fields through the Distance Learning Institute. Nowadays, after 65 years of existence, there are nearly 14,000 students registered in undergraduate and graduate programs, as well as a total 22,000 alumni. It proudly stands as the leading higher education institution in the northeastern part of the country and ranks fourth among official universities nationwide. Also, the University has created affiliate branches in Barrancabermeja - home of the most important oil refinery in the country -, El Socorro and Málaga. Recently it has extended its services to Barranquilla and Bogotá through the offer of its Graduate Programs. Bucaramanga's culture has several expressions, from the visual arts such as painting, sculpture, photography, and recently also in experimental demonstrations that incorporate new technology for artistic communication, such as video. Throughout Bucaramanga's history it has hosted many cultural offerings in various areas, causing arts groups to form within the city. One of the main pillars of culture in Bucaramanga is literature, as in the past there was a cultural movement around literature that produced a number of writers. 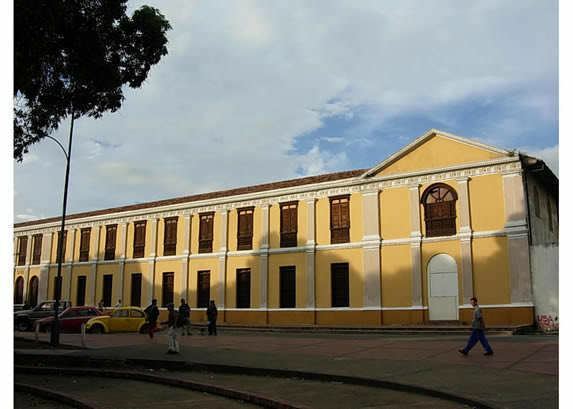 In 1995, the administration of Mayor Luis Fernando Peña Cote decided to convert Gabriel Turbay Public Library to hold the newly created Municipal Institute of Culture, assigning the library building to Gabriel Turbay, who has overseen space management for the institute, which has meant the movement of areas of the library to use the administrative area of the Municipal Institute of Culture. The creation of the Municipal Institute of Culture was conceived in order to expand the possibilities for sponsoring culture in the metropolitan area. But as culture has not traditionally played a leading role in local government, colleges do not receive sufficient funding and incentives to fulfill their purposes. The Institute provides library services, art workshops, and a variety of shows and cultural work from the different neighborhoods of the city. The city sponsors these cultural activities with private investment. Bucaramanga also features a cultural radio station (Station Cultural Luis Carlos Galán Sarmiento) on 100.7 FM. Typical dishes from Bucaramanga include Santander-mute (a soup made from various grains and accompanied by various types of meat), fricassee, a preparation of viscera and goat blood mixed with white rice, roasted meat, arepa de maize pelado, and tamales. Also popular are candied celery, lemon, citron, rice, caramel, and pineapple. Most are produced in neighboring Floridablanca. The Oblea a large, communion-like wafer and veleño bocadillo (a type of fudge made from pureed fruit or pressed caramel, or dulce de leche) are examples of treats found in great quantity in Bucaramanga. Giron:: Located 9 km of Bucaramanga. Founded in 1631, the gold mines were important during the colonial era of tremendous architectural heritage, which made it a national monument. Stands the Museum of Religious Art, with valuable paintings and ancient liturgical objects, The Basilica of the Lord of Miracles, pilgrimage site, and the Chapel of Corregidor, on the outskirts. Socorro: Located 121 kilometres (75 miles) from Bucaramanga. Cradle of the uprising of the villagers, is located in the province Comunera, northeastern department of Santander. It was founded in 1681 and 1711 he was awarded the title of "Very Noble and Loyal Villa". In 1781 Manuela Beltran broke the edict that raised taxes and contributions, which led to the revolt of the Communards. In the main square stand monuments to José Antonio Galán, leader of the uprising, and Antonia Santos. Other attractions are the house of culture and the cathedral. Guane: colonial population home to a seventeenth-century church, the sanctuary of St. Lucia, and the Archaeological Museum, known for its important collection of marine life fossils and colonial period books. Indersantander and Inderbu are the entities responsible for the management and development of local sport in Santander. Bucaramanga has the Estadio Alfonso Lopez, with a current capacity of 28,000 spectators and a star 2 Synthetic Turf. This stadium is the home of the local football teams Atlético Bucaramanga and Real Santander. For other sports the city has the Vicente Diaz Romero coliseum, with a current capacity of 8,000 spectators. This stadium houses the basketball team Búcaros Santander. Another sports complex in the city is the Edmundo Luna Santos Coliseum, located in the Ciudadela Real de Minas area. In 2010 began the construction of the Alejandro Galvis Ramirez Bicentennial Coliseum for the Futsal World 2011, an event that was held in Colombia. Bucaramanga has twice been the scene of the National Games in the year 1941 and 1996, headquarters of the Pan American Cycling Championships in the year 2000 Challenger ATP Seguros Bolivar Tennis in 2006, 2007, 2008, 2009, 2010 and 2011. The Colombian Football Association announced that Bucaramanga will be one of the venue cities to host the 2016 FIFA Futsal World Cup. The average amount of time people spend commuting with public transit in Bucaramanga, for example to and from work, on a weekday is 57 min. 10% of public transit riders, ride for more than 2 hours every day. The average amount of time people wait at a stop or station for public transit is 14 min, while 19% of riders wait for over 20 minutes on average every day. The average distance people usually ride in a single trip with public transit is 5.6 km, while 10% travel for over 12 km in a single direction.